The scriptures are full of topophilia--love of place--in stories of pilgrimage and promised land, shrines and sanctuaries, births and deaths, and of the metaphysical "place" that Jesus called the kingdom of God. Our lives, too, are marked by the places we love. In Harbors of Heaven, Jeffrey Johnson draws on biblical texts, his own memories of childhood in rural Minnesota, and the poetry of Wallace Stevens, Vassar Miller, William Carlos Williams, and others to explore our perception of place. This is a book about our attachment to places, from small and familiar corners of our childhood homes to faraway and imaginary lands. As creatures of the earth, we belong to, and feel at home in, certain places: rooms, homes, gardens, landscapes, countries. They are our places of rest and renewal, our vistas of inspiration, the motherlands to which we are true, the places we love and long for and that orient our lives in time and eternity. 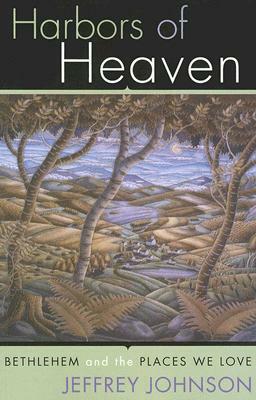 Harbors of Heaven will provoke thinking and reflection about our relationship to the places of our lives, enriching our understanding and appreciation of their meaning and importance. Jeffrey Johnson is pastor of Peace Lutheran Church (ELCA) in Wayland, Massachusetts. He studied at St. Olaf College, Yale Divinity School, and Boston University, and his poems and essays have appeared in The Christian Century, First Things, Christianity and Literature, Anglican Theological Review, Encounter, and The Mars Hill Review. Johnson is also the author of Acquainted with the Night: The Shadow of Death in Contemporary Poetry (Cowley, 2004).